I spent much of Friday down at Marsh Mills where I took over 500 transport photos. I just need to find the time now to process them all. One of the suprises was the sight of the Mayflower Link Trident coming towards me. I naturally expected this to be on the X80 as its not unusual to see the 'wrong' bus on routes with First. However it was actually on the 93 although sadly you have to take my word for it as the destination display has not come through on the photo. One of the drawbacks of this type of display. This is actaully my first photo of this bus since it received this smart livery although it is let down by the missing panel at the rear. "We have been informed at very short notice (Friday 11th March) that the road works on the A379 through Modbury necessitating the temporary shuttle buses and diversion of the 93 will be completed early (instead of 18th March)"
Bit of a backlog I am afraid - lots more tomorrow! I THINK YOU WILL FIND THAT THE MAYFLOWER LINK IS THE 93 AS IT STATES AT THE BOTTOM OF THE BUS...THEREFORE IT IS ON IT'S CORRECT ROUTE!! THE X80 IS THE RIVERIA CONNECTION. You are right - it is on the correct route. My original thought that it was wrong is because this photo was taken at a location which is not served by the 93 normally. 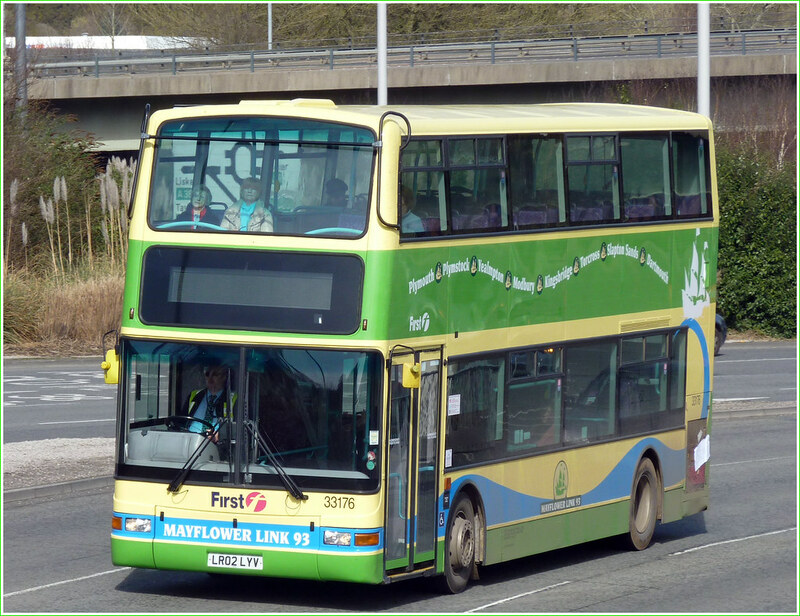 It was not unusual to see Mayflower link buses on the X80.